Bedroom with walk-in closet, washing machine ,. Dish washer., 2 bathrooms, 4 bedrooms. 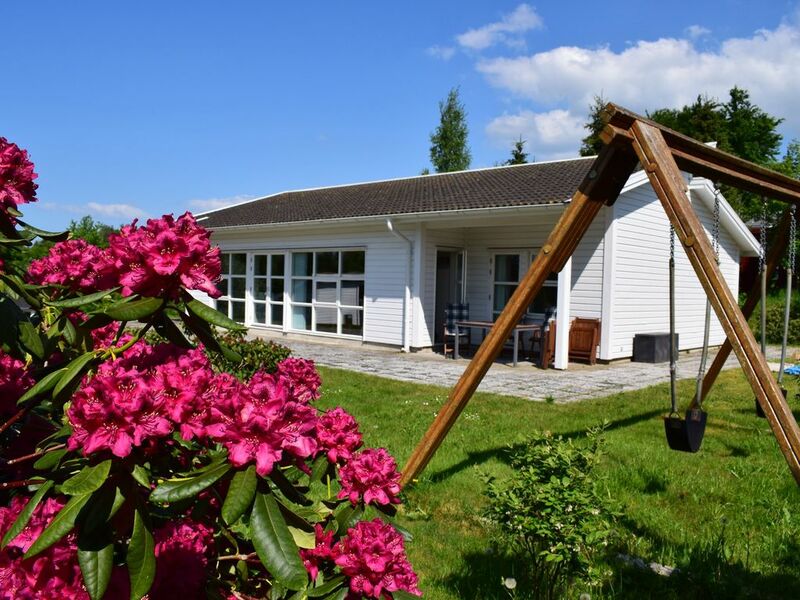 Modern, exclusive 2-family house (built 2010) with top location just 150 meters from the beach in Northwest Zealand. Modern, bright living room through the large front window and high ceilings. Open, modern kitchen with access to the large sun terrace. HWR with washer, dryer and built-in central vacuum. 4 spacious bedrooms (1 master bedroom with walk-in closet and direct access to the bathroom). All bedrooms have an exit to the rear terrace. At the other end of the house is still a bathroom with 2 sinks and shower. Under floor heating throughout the house. Economical heating system installed in the utility room (air conditioning). Quiet location at the end of the road, where a walkway leading to the beach. Beautiful, covered parking with Geräteschubben. Enjoy this luxury home with your family or friends ... and Wonderful Copenhagen is only 45 km away. The additional costs are to be paid extra. Electricity: Dkr 4.00 per KW and water Dkr 60, - per m³. Sheets and towels are not included in the rental price. You can rent linen packages (€ 12.50 per piece) from us. 1 linen package includes: cover, sheets, 1 large and 1 small towel. Internet access costs € 20, - per stay. The bikes can be used for a fee. Home was very good, location great for travel throughout the Zealand area, and easy to connect the rest of Denmark, by ferry or car. House complete with all are needs for our stay, everyone was very happy, with the choice of this home for our stay. Casa agradável e muito confortável. O host era muito simpático e atencioso, a casa correspondia à descrição. Calma e muito confortável. Großzügiges Ferienhaus mit kompletter Ausstattung. Da ist alles was ihr braucht. Und Ruhe pur. Danach ist der Kopf komplett frei. Außerdem war ein sehr netter hilfsbereiter Vermieter. Ein gepflegtes, großzügiges Haus. Gut ausgestattete Küche. Ein Sonnenschirm wurde von uns angefragt und sehr schnell vom Eigentümer gebracht. Es wäre schön, wenn es mehr Sonnenliegen gäbe. Man sollte darauf hinweisen, daß der nahe Strand sehr steinig ist. Im Wasser viele Pflanzen. Es empfehlen sich Badeschuhe. Man ist sehr schnell in Roskilde oder Kopenhagen. This house is situated on the beach at Kirke Hyllinge Vellerup Isefjord. The next largest cities nearby are Frederikssund and Holbæk. You can find Frederikssund right in Fiordland. Four city centers - Jægerspris, Skibby, Slangerup and Fredrikssund - and unique nature. Make Fjordland vacation from everyday stress. Sailing, cycling, fishing and enjoying nature. Experience Danish art of international class and history firsthand. Whether more hour walk or just a short calm stroll - in Fiordland there are many ways to move in the fresh air. Guests can enjoy the fjord views from one of the small ferries or a historic steamboat. Or put the same side of the water from your own boat here. In Frederikssund and in the towns in the area, where you will find castles, galleries and museums. Take your kids on a treasure hunt on Selsø castle or for a leisurely stroll in the palace gardens Jœgerpris where the Frederik Vii and his Gräfing Danner lived. Explore the J. F. Willumsens Musuem, or they bescuhen the Skuldelev Doll's Museum, where they can find toy collection of more than 6000 years old toys from the years 1830 to 1950. On this page you can find an overview of the castles, galleries and museums in and around Frederikssund for children and adults. Holbæk is the place for playful souls. Visit Holbæk kart country and try your hand with fast karts - even for children. On Markedsplads fi nd the most dangerous / challenging playground Denmark with skateboard and Parkour - in winter, a corner of the square transforms into a cozy ice rink. Throughout the summer you can enjoy water activities in the seaside resort of Venice and participate in the many "Blå flag" activities. Jugs, restaurants, cafes and farm shops in Holbæk and the surrounding area offer culinary experiences to suit all budgets on the basis of products from the surrounding areas, eg. As "The Gold from the Isefjord ', the world-famous fjord shrimps, probably the prestigious carrots, asparagus and strawberries the Lammefjord, homemade treats and beer from local breweries. During the summer you can enjoy the beautiful atmosphere that fills the restaurants and cafes Holbæk and the surrounding area, enjoy. Experience the Isefjord from the water on tours, sport fishing trips, charter or corporate sailing. Come even with the sailing ship, you can enjoy the good conditions and the good atmosphere in Holbæk Marina and the old port in Holbæk. The cozy shopping streets in the heart Holbæk are the perfect starting point for a day dedicated to the shopping together with family or friends. You can also visit the three shopping arcades and let yourself be tempted by the many good offers.